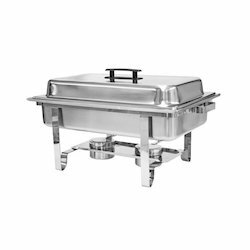 Leading Manufacturer of rectangular o hut chafer, rectangular chafing dish, round roll top chafer and round chafing dish from Mumbai. 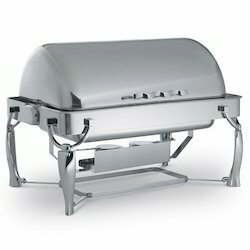 Rectangular O Hut Chafer offered comes in a highly durable finish that ensures long-lasting usage support. Available in stainless steel construction, its polished surface finish also makes it high on aesthetics and can be offered in different size choices. Provided with fuel burner support, the finish features of chafer can also be custom developed as per the specifications provided by customers. Finding wide use in restaurants, hotel industry as well as in catering applications, it helps in adding an enchanting elegance and flair to buffet tables. 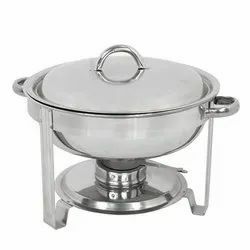 Round Roll Top Chafer offered comes in quality metal finish that makes it long lasting in usage. Featuring smooth shiny finish which makes these highly desirable, it can be offered in different volume capacities. 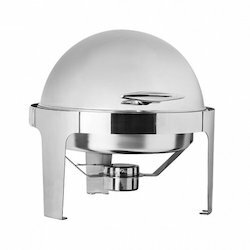 Ideally suited for events like buffet dinners, organizing wedding meals and others, it is provided with fuel burner support where its exclusive finish also makes it high on aesthetics. The design and other finish parameters including construction metal choice can also be customized as demanded by customers.